Only one project is currently in progress and it is *gasp* 100% BY HAND! This will be a long term project so it will fit into OMG's. 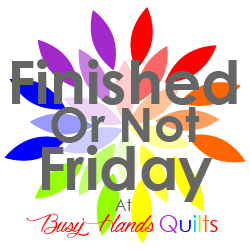 If you want to join in head over to Elm Street Quilts. For April 2019, the One Month Goal is to create a Quilt-As-You-Go Block from the Moda Matchbox Quilt Kit #1. Thanks to Patty for hosting both OMG & the Hand Pieced QAL!!! After falling in love with Patty's rainbow example on Elm Street Quilts blog, I watched several of Simple. Handmade. Everyday's Kristin Esser's YouTube Videos and decided to jump into hand piecing and it was fun. I'm still getting my fingers used to the action, but that's the way it goes. 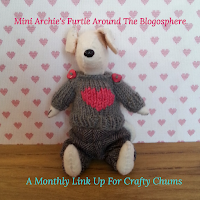 It does seem strange to me that crocheting felt natural, but hand sewing not so much. I enjoyed crocheting, but the results don't make me happy. Being allergic to wool doesn't help, so I am stuck with either cotton yarn or polyester. I did enjoy making squares from cotton yarn, but it's also quite heavy. I'm sticking with quilting which makes me happy! What are you working on? What makes your heart sing when you do it? Off to a good start! 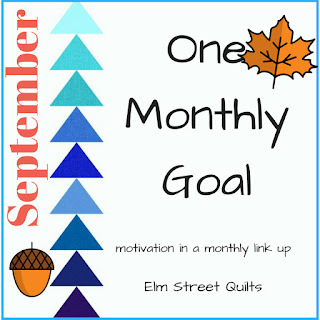 Thanks for linking up with Elm Street Quilts and good luck with your project! Thanks so much, Patty! Looking forward to being back in the OMG's after 3-months off. It's going to be a great OMG! Enjoy your stitching! So sorry that your allergy doesn't let you enjoy crochet! The shop where I work carries yarn as well as wool, cross stitch and quilting. My hobby is quilting but I love seeing all the lovely yarns that come through. If I couldn't use them I wouldn't crochet either! So glad you've found another way to work by hand. I'm not so good at hand piecing or hand quilting, but I love seeing those that do. That's what makes your posts so enjoyable. Thanks for sharing on Wednesday Wait Loss. I enjoy WWL! All of crafting is fun to look at the supplies and think of all the possibilities!!! Thanks so much, Jennifer. I love crochet, too! I'm currently crocheting a rug from the selvages of fabric. Otherwise I enjoy making teddy bears for Mother Bear project from acrylic yarn. But I'd rather be quilting. I'm making pieced borders on a mystery quilt right now. BTW, thanks for commenting on my blog! You're a no-reply commenter, so I couldn't send you a direct note of thanks. Thanks, Nancy. I enjoyed your blog post and appreciate you commenting on mine also! Off to a great start. You are so well organised. It will be lovely quilt. Sorry to hear about the crocheting, but you have found a great alternative. Enjoy the hand stitching. Thanks so much, Soma! It is getting more and more fun to hand stitch. That's too sad that you're allergic to wool! I don't crochet much but have used cotton and it is heavy. I'm glad quilting makes you happy! What a challenge you've set for yourself to hand stitch a while quilt. You will feel like you've accomplished something big and wonderful when you're done! And, of course, you will have! Love the colors for your stars. Thanks, Nancy. I'm so enjoying learning something new. It's more fun than I expected.